Platinum Art Deco diamond brooch from the 1920's. 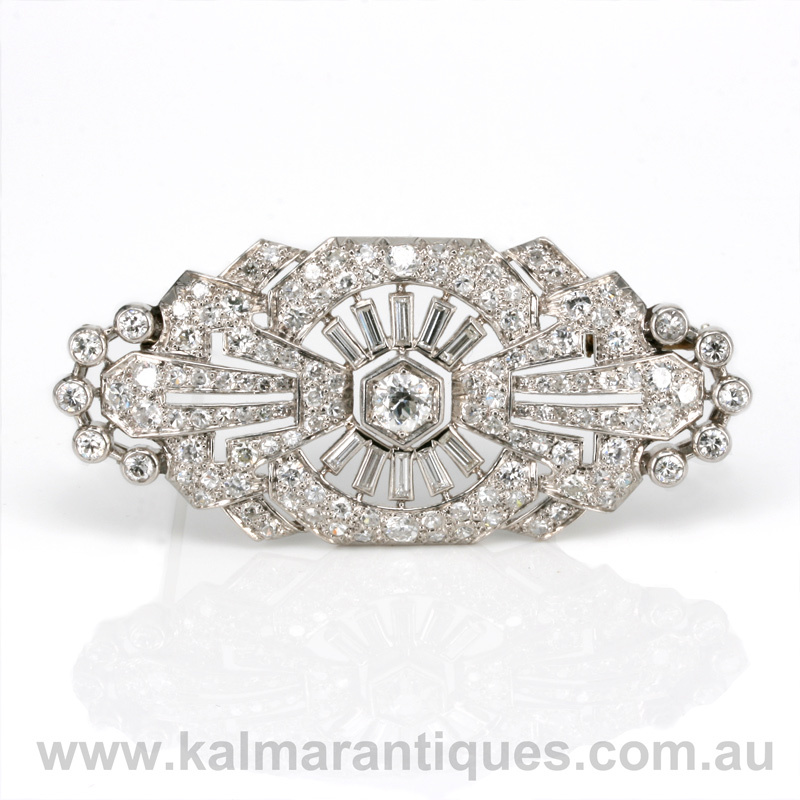 Product code: ES3628 Categories: Art Deco, Art Deco Brooch. Here is a fabulous platinum Art Deco diamond brooch from the 1920’s that is without a doubt one of the finest that you will ever see. Finely hand made entirely in platinum in France, this brooch has all the characteristics of the Art Deco era. Firstly the platinum used still remains the most precious of all the metals used in jewellery and is the purest white in colour and was popular with jewellers during this period in the post World War One era. Then there is the spectacular geometric design which itself characterises this wonderful bygone era. Looking at the design shows just how much thought and time went into making this brooch and is a real testament to the jewellers of this era. And the of course there is the plethora of diamonds that have been set into this brooch to make it sparkle more beautifully than you could ever imagine. In total there are one hundred and thirty three diamonds set into this brooch. Out of these there are twenty three early brilliant cut diamonds, ten baguette cut diamonds and one hundred and two single cut diamonds bringing the total diamond weight to an astonishing 10.24 carats! There is no denying that wearing any piece of jewellery with over 10 carats of diamonds is exciting, let alone when it is a genuine Art Deco brooch made from platinum. And to fit all these diamonds in such an elegant design, the brooch measures 2.6cm wide by 5.8cm wide and will make any outfit really stand out with this being worn. 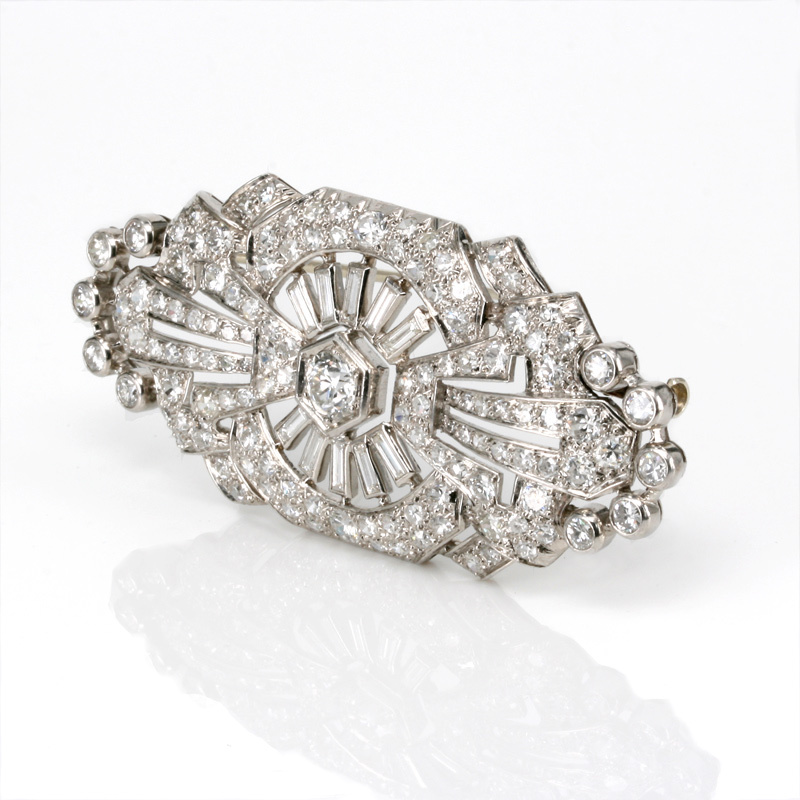 Spectacular and decadent, this genuine Art Deco diamond brooch is certainly one of the finest around and is simply breathtaking.